As we reflect on 2017 and move into 2018, CHW has a lot to celebrate! We celebrate our expanded services, continued growth at our regional offices in Gainesville, Jacksonville, and Ocala, an exciting move to a new 16,000 sq ft corporate office, and the company’s upcoming 30th anniversary. 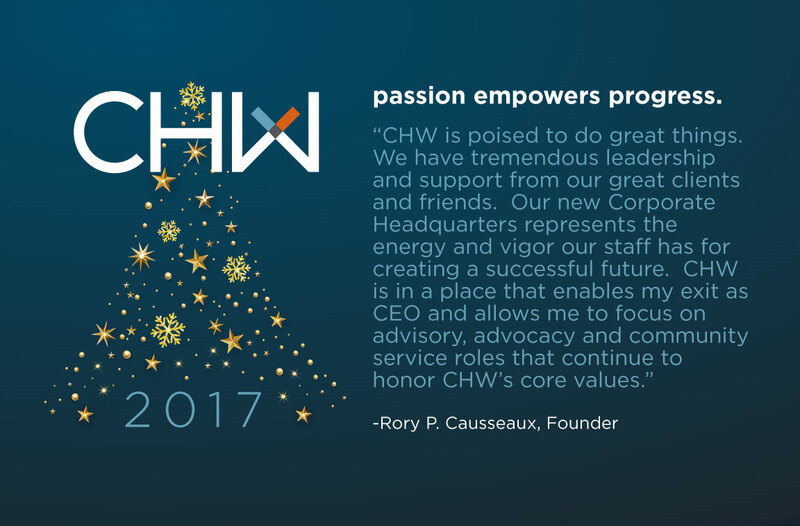 In addition to these wonderful milestones, we now announce that CHW’s Founder and CEO, Rory P. Causseaux, will be transitioning from his CEO duties into the role of Founder and Advocate for CHW. As Founder, Rory’s primary focus will be on advisory, advocacy and community service roles. Rory’s CEO responsibilities will be assumed by Robert J. Walpole, CHW President, beginning January 1, 2018. Please help us congratulate Rory on his new endeavor as we look forward to our continued success together in 2018.